For hours on end, you find yourself bobbing softly with the motion of the Zambezi or Okavango, throwing in your line and slowly pulling it behind the moving boat. After some time you take a swig of beer, pull in the line and see that the bulldog has been nibbled to shreds. You know it was one of them from the way the rest of the lure looks at you with a sorry eye. But you persevere, because you know the adrenalin kick is bound to hit you sooner or later, and you throw in your line again with a fresh piece of bait. The process repeats itself. Sometimes you’re lucky with the bait, other times there’s not even a floppy piece of skin left on the hook. You open another cold one, watch a loaded mokoro drift by, follow a kingfisher with your eyes, and settle into your chair for another round of waiting, waiting and patiently waiting. Then suddenly, just as you’re about to drift off into a midday wonderland, you feel a pull on the line. Then a stronger one, and you know he’s hooked. But you have to be careful because with too hard a pull, he might just as easily hook himself out again. By now you’ve jumped on top of your chair, and even though you try to remain calm – like the guide told you to – you feel your heart pumping faster and your palms sweating as you forget every single tip and tale you’ve heard about how to pull in the king of all river fish. And then, suddenly, you spot a shiny movement on the surface of the water! Your heart jumps into your throat, you heave him onto the boat, and there he is, flapping around his muscular body and showing off his razor-sharp teeth! 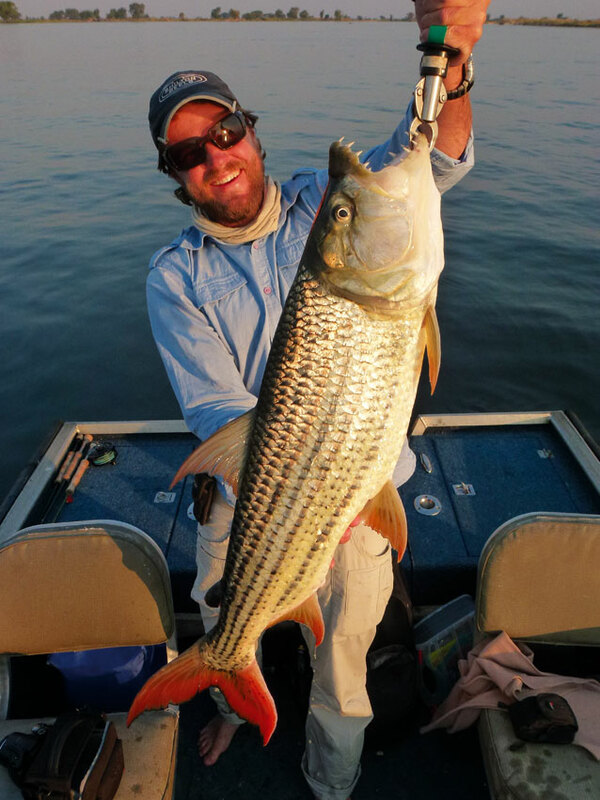 You’ve landed the tiger of the Zambezi, the fiercest fish of them all! Anyone who’s ever sat on a boat waiting for the tiger, will attest that it’s one of those unique experiences you write home about. Of course, in the technological age, you’d rather send an SMS, or better still, MMS a picture of your big one straight to your mom’s phone. 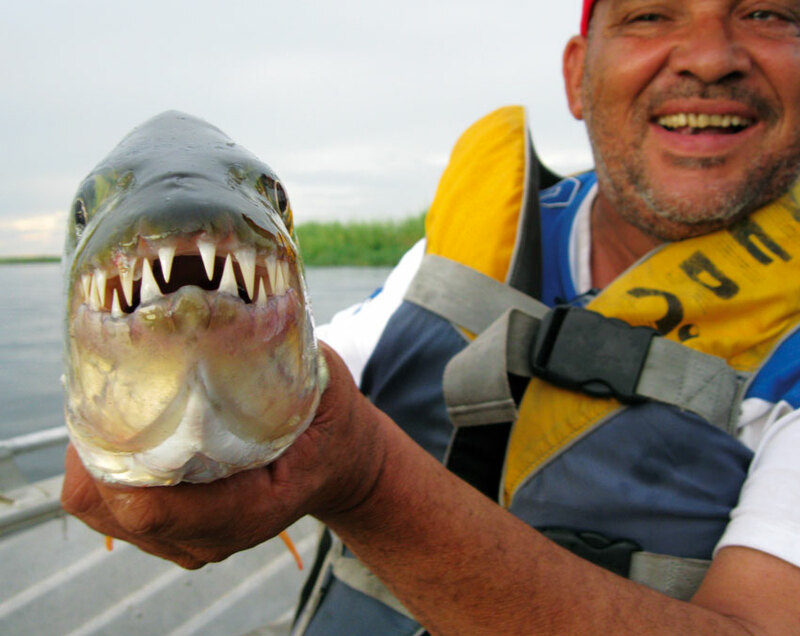 The Internet doesn’t list the tigerfish as one of the ten most diabolical fish on earth for nothing. Comments from the fishermen – and the fisherwomen – provide proof of the pudding: “It was insane!” yelps Sean van der Vyver, who’s pulled out a 1.5 kg. “First time out, what a rush!” ejaculates Mark Gouws, who’s pulled out a 6.1 kg. And “Tough, but worth it,” exclaims Ruan Jooste, after pulling out a monster 8 kg. 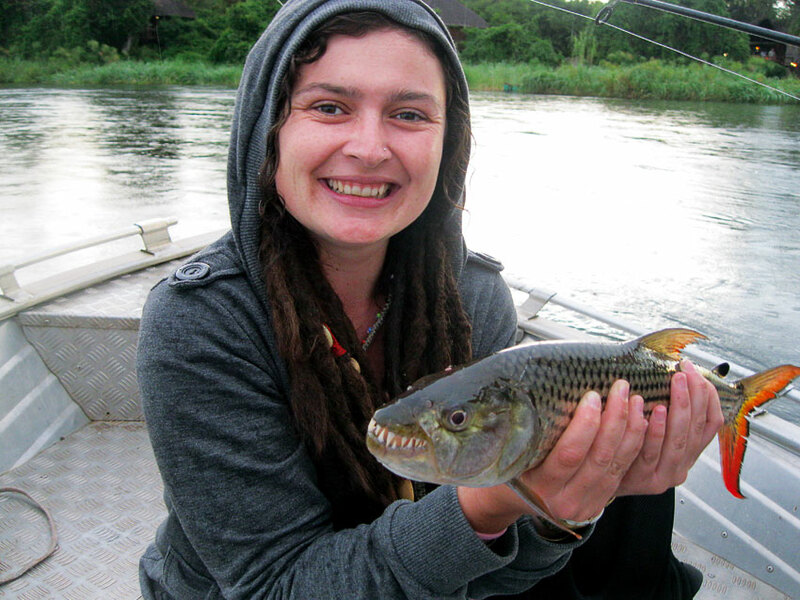 Tigerfish mostly inhabit the warmer, well-oxygenated fresh waters of Southern Africa. 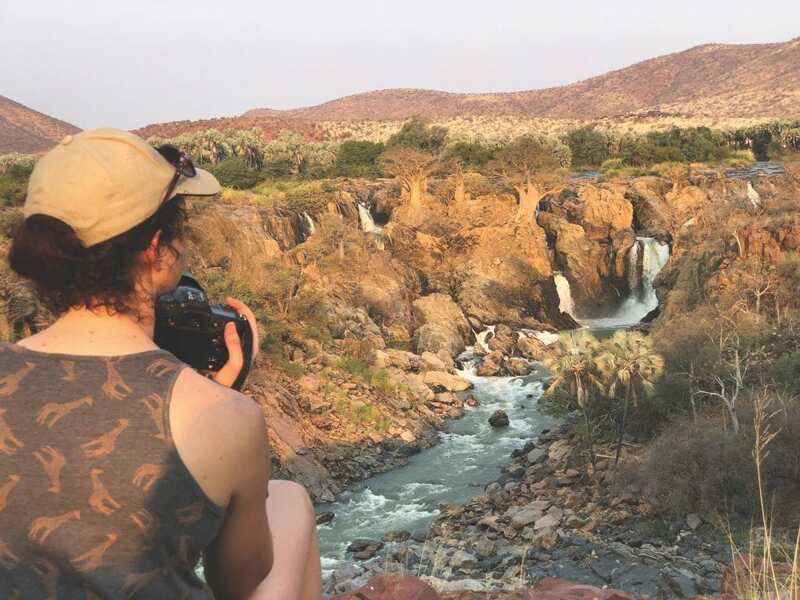 The largest populations are found in the Zambezi, Okavango and Pongolo river systems, making northern Namibia a key location for pursuing the big ones. 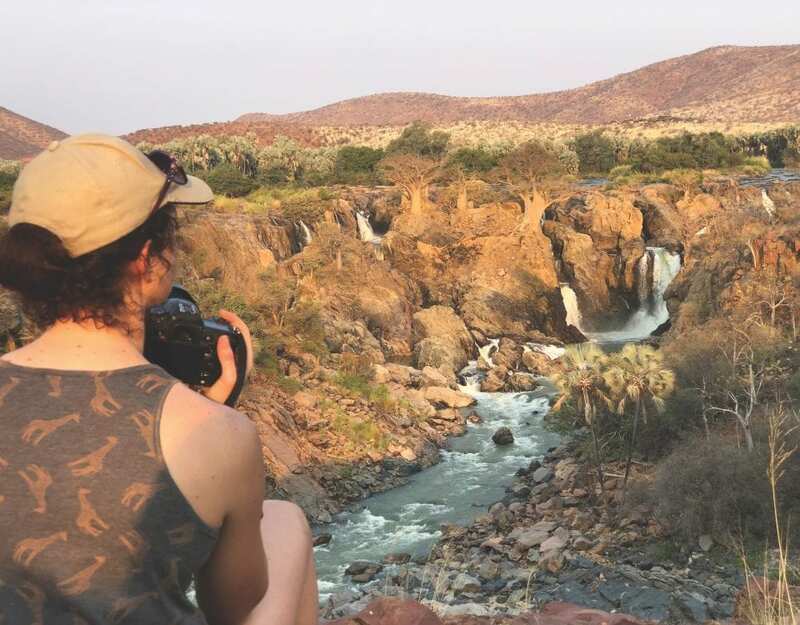 Those found in the fast-flowing waters of the upper Zambezi easily reach 10 kg in weight, and it’s obvious why most adrenaline junkies head in this direction when needing an injection of proper sports fishing. Annual competitions, furthermore, draw the crowds, rods and all. The author with her proud catch. Tigers of the river move and hunt together in schools of like-sized fish. The bigger variety are usually found living on their own, mainly because a bigger monster might snap at its younger sibling and swallow it whole in the process. Known for its aggressive temperament, a tiger won’t hesitate to snap at you either, another reason why it’s not recommended to go swimming in the Zambezi or Okavango rivers. All in all, the experience of pulling in a tiger is one that will stay with you and draw you back until you’ve finally fought with and boated the ultimate 10 kilogrammer. The mighty teeth of the Tiger. 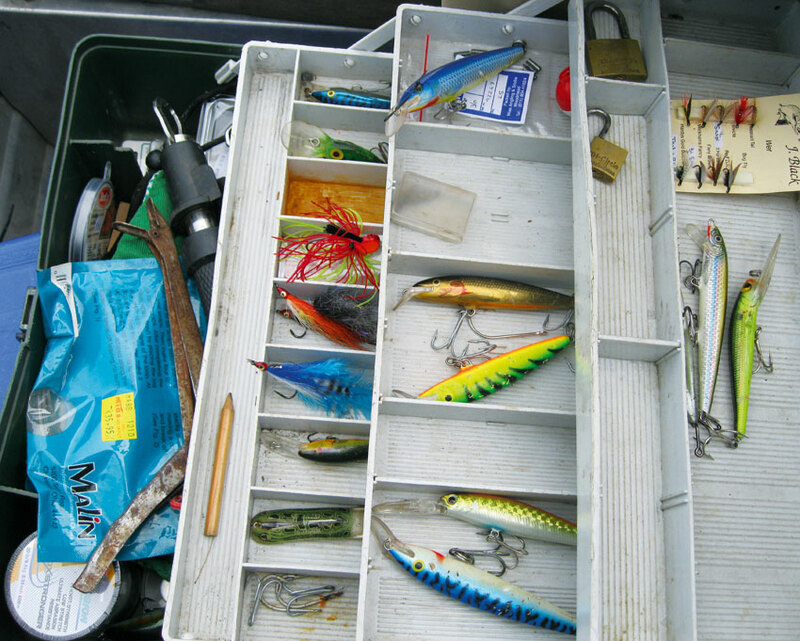 Your bait has to be shiny and moving. This is why sardines, bulldogs and artificial bait are recommended. The best place to catch a big one is where there is fast-moving water. If you catch a tiger, you have to be an expert to pull it out; that’s where the trick comes in. Once the hook is in its mouth, it will fight and jump out of the water. Don’t pull it out immediately. Let it run until it tires, and then pull it out.